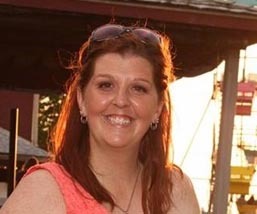 Joleen Anderson is the General Manager with the Old Firehouse Winery. In this role, she coordinates her team in providing all aspects of food and alcohol sales to groups, including motor coaches, group sales events and day to day guest visits. Joleen is no stranger to the wine industry and customer service, having spent 18 years with the Old Firehouse Winery starting as a server and working her way up to be the wine sales manager and finally the General Manager, where she has grown both wine and restaurant sales. Drawing on her years of experience in all areas of the business, Joleen has now increased her focus on group sales and tastings. Catering to groups small and large has always been an important aspect of the Old Firehouse Winery’s business. Rebecca Ritz, Founder & Designer, Bauerhaus Design, Inc.
Donniella Winchell is currently the Executive Director of the Ohio Wine Producers Association and chair of their Vintage Ohio wine festival. She is on the board of the Winegrape Growers of America and the WineAmerica State Advisory Panel. In addition, she is the recipient of Monteith Trophy given annually to one national figure in the American grape and wine community, is a member of the Knights of the Vine, received Ohio Travel Association’s Paul Sherlock award, the Paul Harris Rotary award and is a member of Ohio Wine Hall of Fame. She helped to create the License to Steal, National Wine Marketing Conference. She was on the founding boards of several retinal tourism organizations and served as a trustee for both the Ohio Travel Association and for many years on the Ohio Division of T and T Advisory Board. She also sits on several regional and state economic development committees. Winchell is a graduate of Allegheny College with a BA in history and taught in Ohio public schools before retiring to raise a family. She then joined the Ohio Wine Producers Association and has served as their Executive Director for most of her professional career. The Winchell family also owns a marketing services agency and brochure distribution service as well as a family entertainment center, Adventure Zone, in the resort community of Geneva-on-the-Lake, Ohio. She and her husband have three married children, six beautiful granddaughters, and three handsome grandsons. They live in the Grand River Viticultural district in northeast Ohio. Subscribe to our newsletter to receive updates from us about License to Steal.